To understand a dental implant, you first need to have a general idea of the tooth structure. The visible part of a tooth is called the crown. The root of the tooth is hidden inside the gum. The crown and root comprise a tooth. 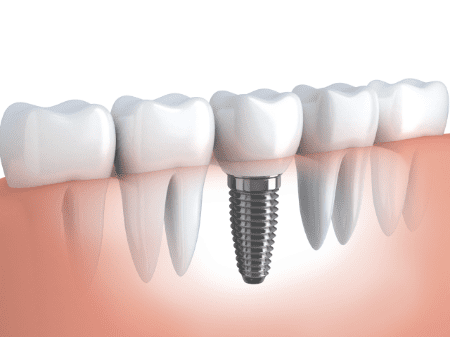 A dental implant replaces the root part of a tooth. The dentist then places a permanent crown on the implant, so the entire setup looks and works like a natural tooth. What are the Advantages of a Having a Dental Implant? What is the Procedure of Placing a Dental Implant? What are Some Frequently Asked Questions about Dental Implants? Can dental implants work for everyone? Most people can get dental implants without any problem. However, dentists do not suggest implants for children or younger teens. The dentist also checks for the availability of a sizeable amount of healthy bone to support the implant. What materials are used to make dental implants? Titanium and zirconia are the two most used materials to make dental implants. No, it is not painful. Is there a possibility of implant rejection? In extremely rare cases, yes, there is a possibility of rejection. However, the condition is not dangerous. The dentist implants it at a newer place. Do dental implants require extensive care? No, they do not require any special care once the healing period is completed. However, you need to follow the basic oral care habits like brushing twice a day, and flossing for at least once a day. You also need to make periodical dental appointments to check the condition of the implant. Our Fremont implant dentist has helped hundreds of people get beautiful and stronger teeth. If you are looking for quality implant dentistry services in Fremont, CA or surrounding cities, give us a call us and get in touch with our experts.